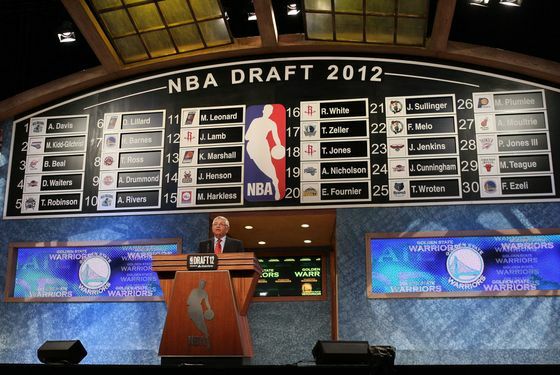 A relatively quiet week in sports was highlighted by Thursday night's NBA draft, perhaps the league's final event in New Jersey for a while. It was a relatively quiet draft, too, with nowhere near as many zany trades as we expected. The Knicks, picking near the end of the draft, came away with this Greek guy. The Nets traded their way into Kansas's Tyshawn Taylor (perhaps with Deron Williams's free agency in mind) and added a couple guys from abroad as well. Meanwhile, Moe Harkless of St. John's ended up with the 76ers. In other basketball news, Amar'e Stoudemire got fined for some unfortunate word choice on Twitter, the Knicks looked ahead to free agency with Steve Novak and Jeremy Lin's Bird rights in hand (and a league appeal looking to be headed for a settlement) and J.R. Smith hoping for a raise, and Donnie Walsh got himself a new (old) gig. The Nets busied themselves with dazzling the aforementioned free agent, Deron Williams. Oh, and one of the area's best reporters switched from the Knicks beat to the Nets beat. In baseball, the Yankees dominated the Subway Series before parting ways with the Mets. They'd go on to grab the best record in baseball, but followed a few victories (highlighted by Dewayne Wise's poorly announced home run and poorly officiated non-catch). Then half their pitching staff broke and their bullpen kinda fell apart. Our old friend David Wells would be nice to have around right now. The Mets had some rough moments, but have a chance to make some moves this weekend. Other stuff: Muhammad Wilkerson had a very scary moment, but is okay. Barack Obama made an uncouth Kevin Youkilis joke. The vice-president of the KHL was confused about arenas. Tennis was worth watching. It really was. And is. We wondered whether Yankee Stadium or Fenway Park hosts better movies. It was a fine week. Have lovely weekends, all!